Place the warm water in an electric mixer, sprinkle over the gelatine and stir to combine. Set aside. Place the sugar, glucose and extra water in a medium saucepan over low heat and cook, stirring, until the sugar is dissolved. Increase heat to high and bring to the boil. Add a sugar (candy) thermometer and cook, without stirring (for approximately 5–7 minutes), until the temperature reaches 115°C (239°F) or soft ball stage. With the mixer running on high, gradually add the hot syrup in a thin, steady stream to the gelatine mixture. Add the vanilla seeds and beat for 5–7 minutes or until thick and fluffy. Working quickly, spoon mixture into a lightly greased 20cm x 30cm tin lined with lightly greased, non-stick baking paper++. Using a spatula, smooth the top and cover with lightly greased non-stick baking paper (see tips + tricks, page 58). Refrigerate for 1–2 hours or until set. To make the icing sugar mixture, place the icing sugar and cornflour in a bowl and mix to combine. 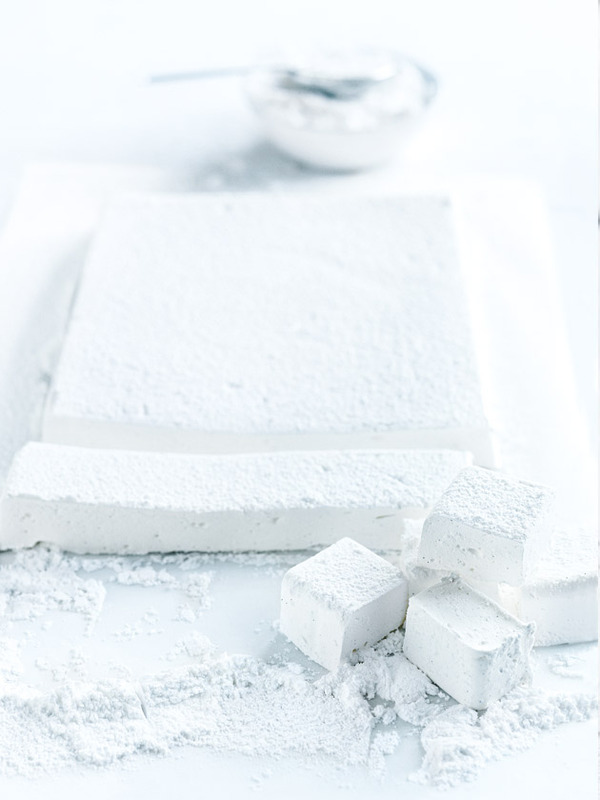 Turn the marshmallow out onto a surface lightly dusted with some icing sugar mixture. Dust the knife in the icing sugar mixture and cut into squares. Dust the marshmallows with more icing sugar mixture. Makes 40. + Liquid glucose is available from the baking aisle in most supermarkets. ++ Ensure you have have enough baking paper hanging over the sides so you can lift the mallow from the tin once it has set. Is it possible to substitute the vanilla bean, for vanilla bean paste? If so, How much? Hi Michelle, you can store these marshmallows in corn flour in an airtight container for up to a week! Enjoy. Just wondering how far in advance you can make these/ how long they will last? Hi there! I live in Zambia and in the middle of the bush, so ingredients are often hard to come by. Is there a substitute for liquid glucose? Absolutely love your recipes, we have tried many of them in our kitchen.